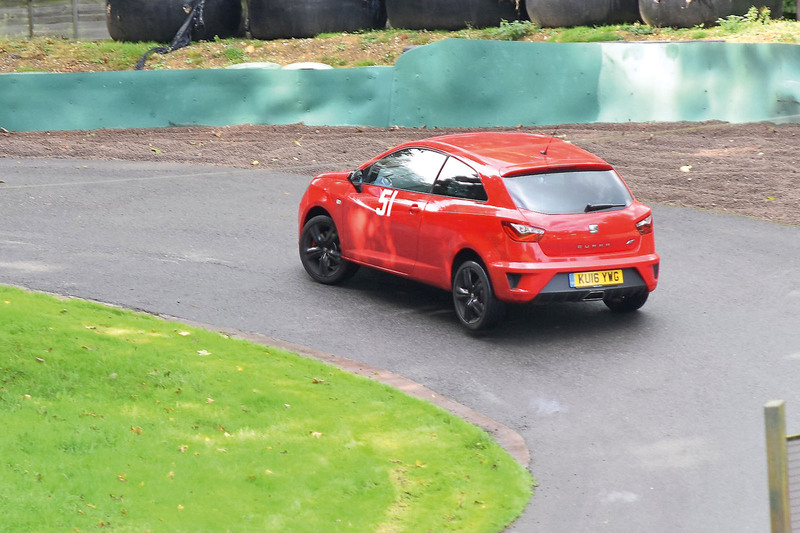 When I rocked up to my first MSA hillclimb event at Prescott in the Seat Ibiza Cupra, it took me a whole minute to convince the entrance security staff I was a competitor. “What, you’re going up the hill in this?” asked the gatekeeper after I’d said we were car 51. I could see his colleague peering through the window at the completely standard and luggage-filled interior. “Yeah, we’ve got paddock passes,” I replied, slightly bemused by their doubts. In the paddock, it soon became clear why the entrance staff were surprised to see an unmodified 16-plate Ibiza Cupra turning up to compete. Specialised single-seaters, classic formula cars and other highly modified racers sat side by side in their paddock slots. Roll cages and semi-slick tyres abounded. I’m going to come plumb last, I thought. It’s very odd watching an MSA scrutineer check over a nearly new road car, and even odder having to slip into a fireproof race suit to drive it. All that done, I lined up ready to face the hill, dampers set to Sport and stability control very much still on. The light went green. The surface was greasy from morning rain, so I was careful off the line, only allowing for light wheelspin in first gear. I changed into second and as the car’s thick 236lb ft wad of torque arrived, the front wheels scrabbled for grip in second and again in third. The rest of the hill was daunting, scary and technical. The slippery conditions meant I was well within the car’s limits under braking and often a gear higher than you’d expect on corner exits, but it meant I could lean on the strong mid-range grunt to pull me up the hill without fear of understeer-inducing wheelspin. Through the day I chipped away at my times, not expecting to rank anywhere near our track-prepared hot hatch rivals. But after two timed runs I was fourth quickest and closest to my handicap time, leaving me with the class win. Blimey. Later, I peeled the numbers off the Cupra, filled it with luggage and drove the 100 miles home, averaging 40mpg on the way. I should never have doubted it.